Once again, I apologize for my sparse postings here,....these last few months though have been very hectic. When I last left you we had just moved to another property down the road a piece. Since then things have been going very slowly.Money has been extremely tight and at times non existent. We knew there would be times like these,but we also know that they will pass. We just need to remember to keep our energy posotive, stay open to all the possibilities, and oportunities will come our way. With practice and discilpline we can create any reality we chose. A few weeks ago things got really bad. Our van, a giant gas guzzling (12 miles per gallon,on a good day)Ford econoline monster was sucking up nearly all our funds . We tried to sell it, hoping to get at least a 1000 for it,but because of bad body damage,we fell woefully short,bringing in only 700 at a local used car dealer. This was quite a setback as we were really counting on at least a 1000. We were happy though, we rid ourselves of the gas guzzler and had 700 in our pocket,it was something. One problem though, we now had nothing to drive around town.You see, the bus is in an area that is very difficult to get out of,and it was just not practical to take it in and out every time we needed to go to the store. 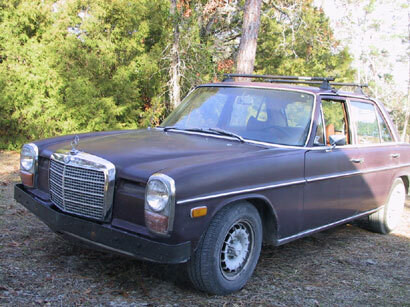 It just so happened a friend of ours had a beautiful, brown, 1973 diesel mercedes,with only 40,000 original miles on it. He was looking to sell, and would allow us pay for it in instalments. The great thing about this car,besides how beautiful and old it is ( it is now considered an antique!) is that it is a diesel,which means we can convert it to run on veggie oil.That way we have both the bus and our car running on veggie oil. We figured we could tow the car behind us and use it to get around town when we are parked. Needless to say, we went for it. After paying for insurance and registration we had about 100 left,and with that we were able to buy parts for the veggie oil conversion on the bus. We are now back in the same situation as before, except now we have a very good running diesel mercedes and some parts for the engine conversion. All is not lost though as we just got word tonight that there is good petitioning in california, starting in March. 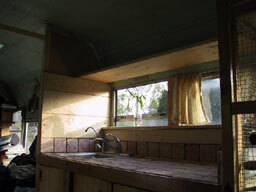 If we can somehow manage to make enough money in the next few weeks to finish our engine conversion and register the bus,then after our court apperane ( March 1, testifying for a dear friend) we can leave ! Let me tell you it is definitely way past time to leave this place. When you travel like we do, you start to get a feeling in your bones when it is time to move on,and it is definitely time. 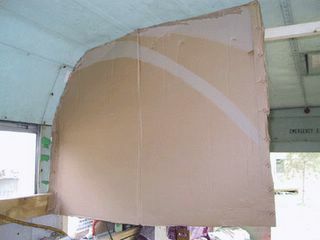 Yes,the bus will only be partially converted, but after doing some petitioniong work in c.a for a few weeks, that will give us enough to finish the bus right, pay some bills and have lots left over. Then finally we can get to focusing on what we really want to do, our artwork and music endevours. Anyway, on the bus front,we have acomplished a bit more. 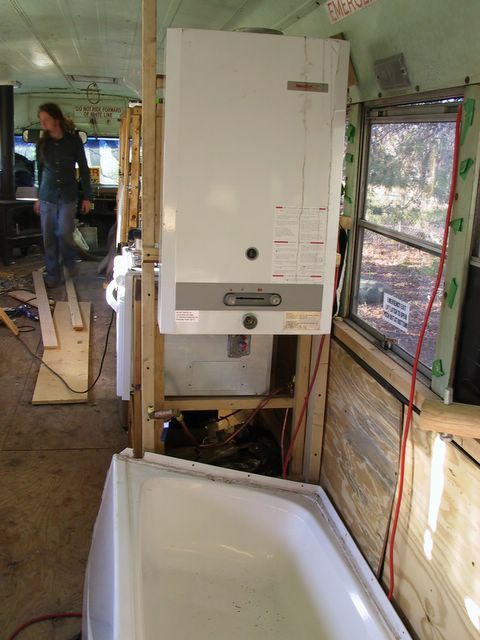 First, in the kitchen and living room we have put up some more t&g , in what will be the bathroom area we have hung the Aquastar propane hot water heater and set in the bathtub. 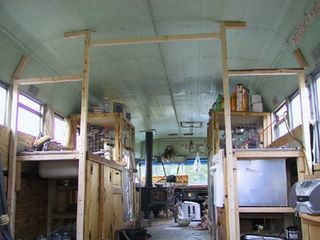 We have raised the bed and are now working on building the walls and loft area. Since money has lately been tight we have not been able to do a lot of the big stuff we need to. We do have lots of other finishing woods and such though, so that is what we have been focusing on. Thats about it for now,....with any luck and a little money we will be leaving here around March secound.Something will come up,I just no it will, we just need to stay open, receptive and follow our intuition. The Aquastar on demand hot water heater hanging in what will be the bathroom area.Obviously a ton of work yet to do here. 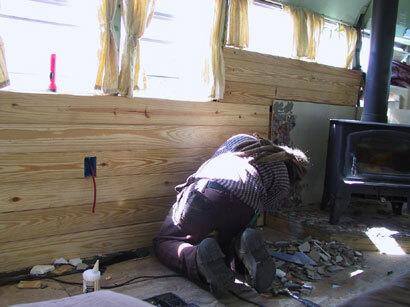 Putting up some t&g on the walls and working on the electric wiring. Putting up the walls in the kitchen. Yes,..I know it's been quite a bit of time since my last post, please forgive me,....but I have lots of good exscuses. Really, I do. We have been drawn into a rather large,involved dramma here in Weeki Wachee Fl. I want to respect the privacy of those involved, namly the kind folks who are allowing us to convert our bus on their property. So without going into much further detail I will just say it involves a clear cut case of flat out harassment by the dept of children and family services,to the extent that if I had not been here to witness it first hand,I would have never believed it. Witness it we did, and Moss and I will be testifying to that in a court of law in March. Because of all this mayhem the folks who have been allowng us to work on our bus on their property,were forced to move. Being the kind people they are,they allowed us to move to another nearby property that they own. It is much nicer with lots of oak trees and a minature horse that has the run off the place. Her name is Sweetie Pie and she really is just that. I will be posting pics of her. The only difficulty is that we do not have wifi or any other type of net access there.So,......we are forced to drive to her old place and sit in the driveway to pick up a signal. Which we gladly do, for you dear reader, though we will not be able to post as often as we would like. On the bus front, we have made a bit more progress. We have finished the kitchen, raised the bed and almost finished the propane system. Next we start on the vegie oil engine conversion. I have done some more work on the tile mosaic also,though it still has a long way to go. Thats about it for now, looks we will be here at least another month.We are however,going to try very hard to make the Ocala Rainbow gathering. 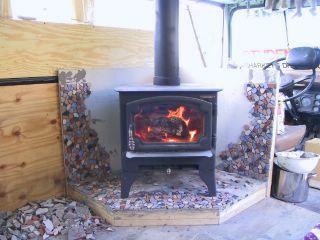 Here is the tile mosaic I am working on for the hearth.